VISTA Photometry is on the VISTA system, tied to (but different from) 2MASS, calibrated via colour equations between the two systems (below). Briefly the following steps are followed to calibrate a single VISTA pawprint. 1. All detectors are normalised to the same approximate gain using the flatfield exposures. 2. 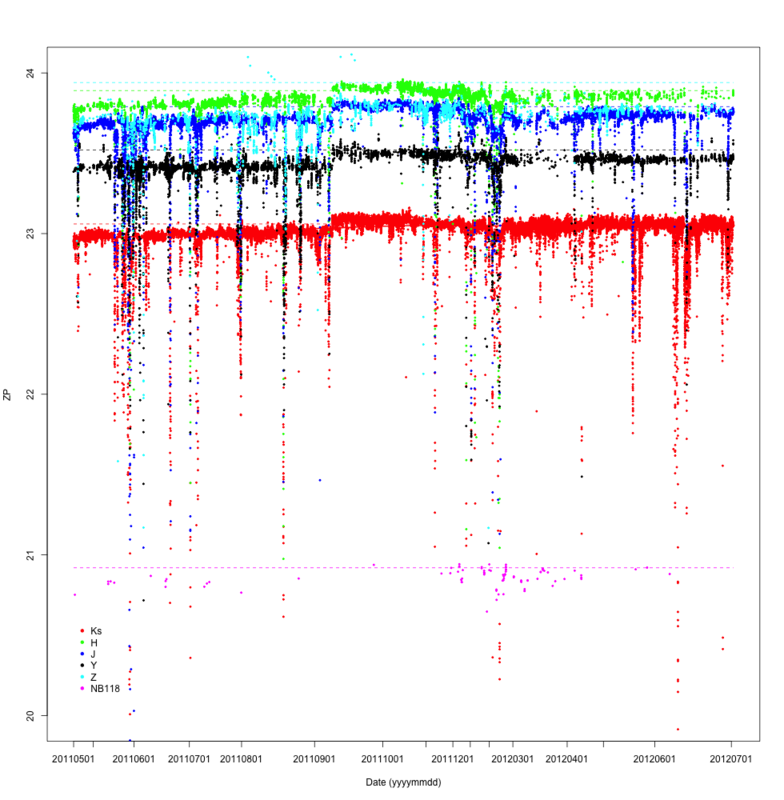 The catalogue of sources detected (via imcore) on each VISTA detector is crossmatched against the 2MASS catalogue (this is also used to refine the astrometric solution). 3. The 2MASS magnitudes for all matching stars are converted to expected VISTA magnitudes using the colour equations (below), including terms to account for interstellar reddening. 5. A single preliminary median (of all 16 detectors) Zeropoint is written to the FITS header (keyword: MAGZPT), while the scatter in the measurements (the median absolute deviation MAD*1.48, a robust estimate of the Gaussian sigma) forms a measure in the error in the Zeropoint (keyword: MAGZRR). 6. A final stage to the photometric calibration takes account of systematic differences between the 16 detectors, measured on a monthly basis. 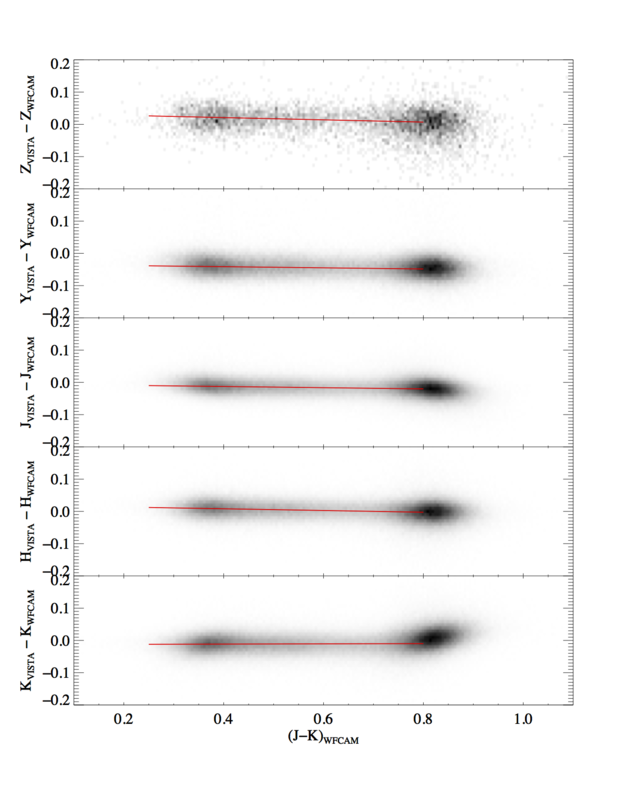 The residuals from all 2MASS stars used in the frame zero-point determination (i.e. 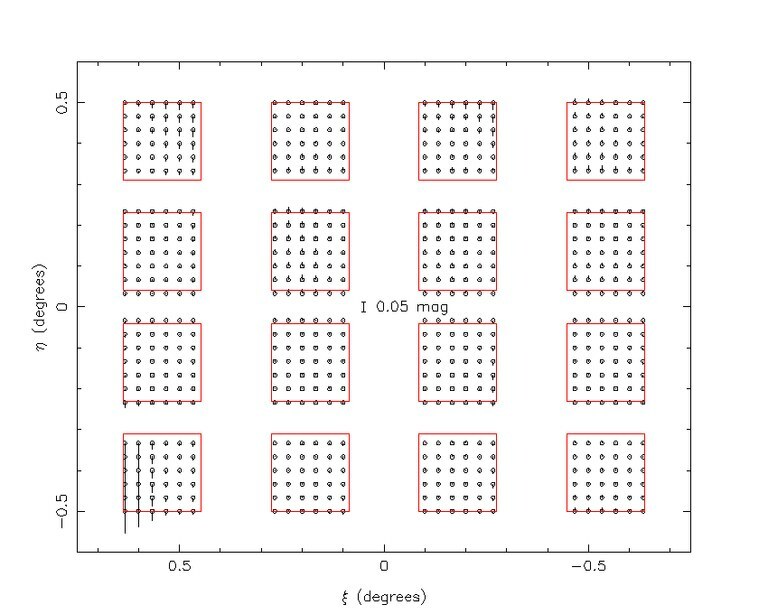 J, H, Ks signal:noise >10:1) are also computed on a per pointing basis together with their standard coordinate location with respect to the tangent point of the telescope optical axis. The residuals are stacked and used to generate delta-Zeropoints per detector (the value of MAGZPT is actually updated for each detector). 7. At the time of writing, no significant spatial residuals (above the detector-to-detector offsets) are seen (e.g. that could arise from scattered light). More details below. In deriving the photometric zero-point per field we also make a correction for Galactic extinction toward each star used proportional to E(B-V). The initial value is taken directly from the Schlegel et al. 1998 extinction map values, however if this leads to an extinction-corrected (J-Ks) outside the range of 0 to 1 the per star extinction is recomputed to yield the median stellar population colour.. The coefficients used for the correction are: 0.264, 0.103, 0.000, 0.000, 0.005 for Z, Y, J, H, Ks respectively in the sense of increasing the inferred zero-point. The maximum offset is limited to E(B-V) = 10 due to an increasing non-linear dependency in high extinction regions. To compute extinction-corrected magnitudes we use the relevant Schafly et al. 2011 coefficients for Rv=3.1, with small adjustments due to the differences in the effective central wavelengths of the VISTA bands. These are respectively: 1.395, 1.017, 0.705, 0.441, 0.308 for Z, Y, J, H, Ks. For catalogues labeled with CASUVERS 1.3. * or earlier, we use 2nd pass (improved) colour equations and zeropoints, derived from to 2MASS from a compilation of data measured on good (photometric) nights, with good seeing, and for fields with E(B-V)<0.1. 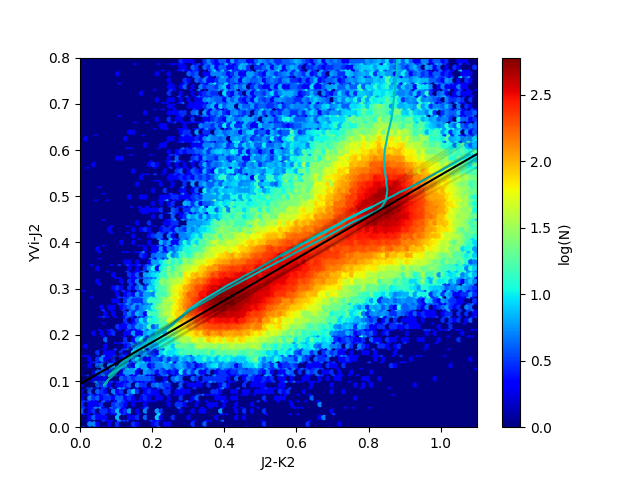 The nominal ZPs are unchanged, but the colour equations have been adjusted slightly to give robust fits to the data. Earlier colour equations are reproduced at the bottom of this page for completeness. The uncertainties should be considered systematic; they are the rms of best fit values when fitting over different ranges of J-K colour. 1 pixel < seeing < 1.25"
Most of these point sources were observed several (up to ~500) times by the same telescope with the same filter. We merged these repeat observations and retained some statistics on how the magnitude varies for individual objects. Finally, we cross-matched objects across filters & telescopes by taking the closest match within 1". Detected object catalogues for each final product stacked pawprint image were calibrated with respect to 2MASS and the individual photometric residuals recorded. The image processing stage produces an internally consistent gain-corrected set of detector images which means, at least to first order, a single overall zero-point per pointing suffices to calibrate the photometry to an external system. This has the benefit that all suitable 2MASS stars for all 16 detectors for any given pointing product can be used with a consequent sub-% rms error on the derived value. Subsequent calibration steps (e.g. Hodgkin et al. 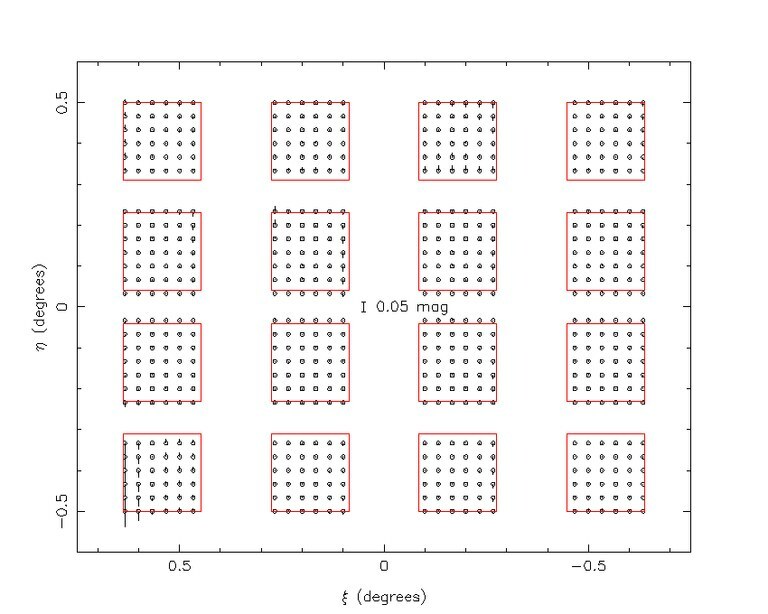 2009) can then focus on deriving the systematic variations such as individual small differences in detector zero-points and subtle illumination corrections across the focal plane. We illustrate the combined size of both of these systematic effects for J-band data taken during this period. By suitable binning and combining all the photometric residuals for each detector region on the focal plane, any small scale systematics in 2MASS average out and we are left solely with effects due to VISTA and the processing system. In this on-sky orientation N is to the top and E to the left with detector#1 top right, detector#4 bottom right and detector#16 bottom left. As can be seen, even without individual detector corrections the overall systematics are generally at the % level apart from the outer part of detector#16 which is known to have some interesting imaging properties. Similar overviews are available for Z, Y, H, Ks and NB118 and will be added to this page later. Note: that photometric corrections due to the known astrometric distortion effect have already been allowed for during the calibration; and that since VISTA observes at a variety of PAs all data has been "rotated" back to PA = 0 degrees in producing this stacked plot - with more data we need to investigate this at fixed PAs to look for other effects. Similar overviews are available for Z, Y, H, Ks and NB118 and the full set of these plots can be found here. with respect to 2MASS; and a first pass estimate of the illumination corrections in the 6 filters in use during this period. 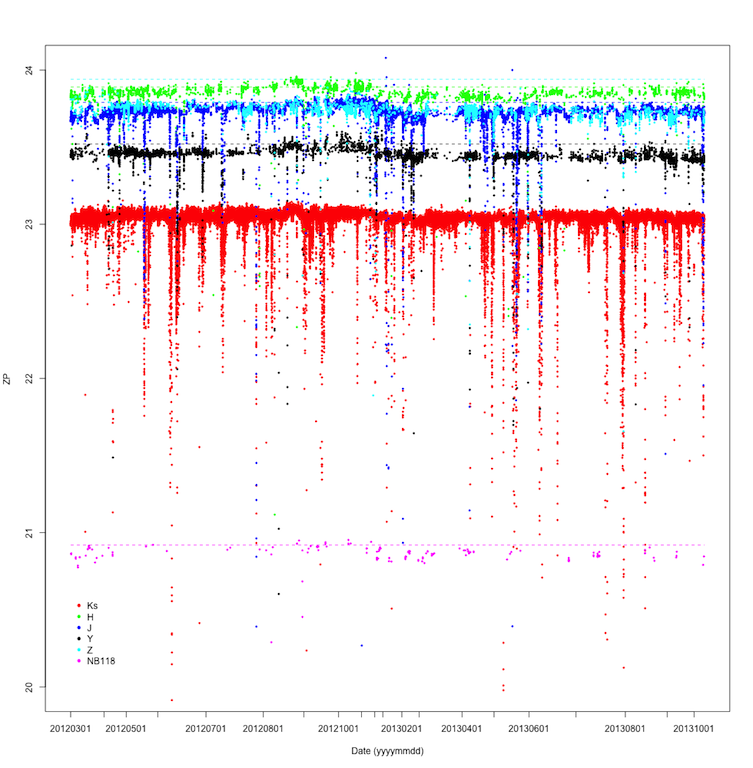 Variation of measured photometric zeropoints (ADU) in: Z (lightblue), Y (black), J (blue), H (green), Ks (red), passbands over the period 20th May 2009 to 23rd June 2009 (see summary QC pages ..... for further details of individual nights). This includes non-photometric conditions such as occurred in the middle of this period. 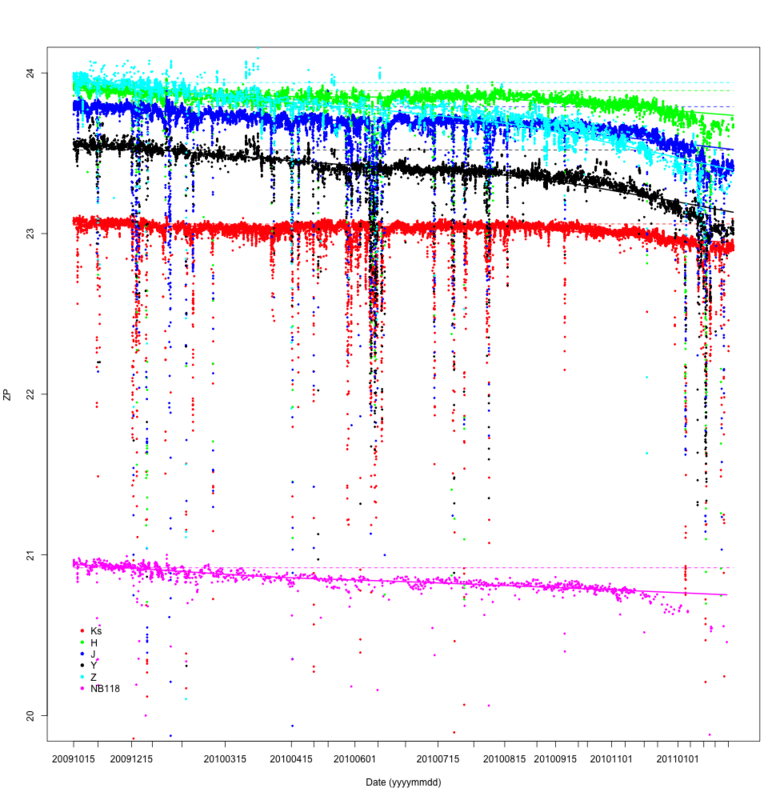 The following figure shows the variation of the zero point from the start of the science verification and dry run observations to March 2011 (note that the primary mirror was recoated in September 2009).